The cymbal is an instrument which seems to be from Greek origin (at least for its name: "kymbalon"). 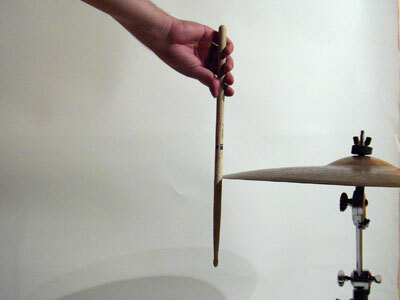 The shape of the cymbal consists of two truncated spheres, which the smallest is intercepted by the largest (we can speak about "double dome") and with the same central axis. The thickness of the cymbal is refined as we go closer to the edge (which the angles are more or less rounded to avoid cuts when we handle them). Bronze (copper + tin) is invariably its material, in varying proportions (traditionally 80% copper for 20% tin alloy, commonly called "B20" but today there is also made "B8" (8% tin), cheaper, higher pitched and more fragile). Some manufacturers introduce small proportions of silver or even gold or titanium, in some of their models. They are finished by chiselling (or "turning" or "lathing") or even polishing to give a brilliant look (this visual look obviously entervenes on the sound, and gives them their super high overtones and bigger saturation qualities). 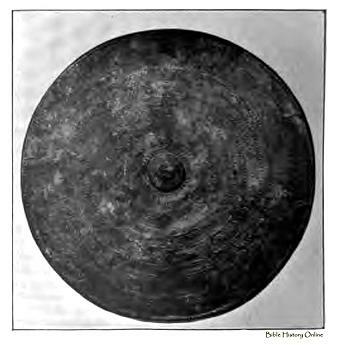 The origin of the shape of the cymbals seems clearly military first: it is exactly the shape of a prehistoric bronze shield (Bronze Age photo: Etruscan shield), whose function was to repel spear's and arrow's points (hence the central reinforcement, place the most vulnerable face on, against a spear, and the perfectly curved shape to deflect arrows). The musical origine itself is probably for fighters to hit their shield with their weapon to frighten the enemy, encourage themselves and indicate the number of their forces, perpetuated until the Crusades. The oldest specimens of cymbals, found archaeologically came among others, from Greek tombs (photo: Athens, -500 BC). The bronze oxides but oxidation of the copper is solid and stable (green), unlike the rusting of iron, which explains the excellent preservation of antique cymbals and bronze statues of several thousand years. 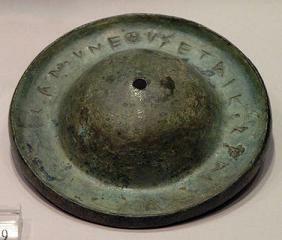 Ancient Greek cymbals were small (about 10'') and thick (not like the current "splash" cymbals). They had more a "gong" sound, more dry and resonant than "crash" (they did not "saturate"). Some manufacturers have reintroduced the same models, which are interesting to play melodies (Zildjian "Zil-Bell" for example, created at the request of Tim Alexander (Primus)). 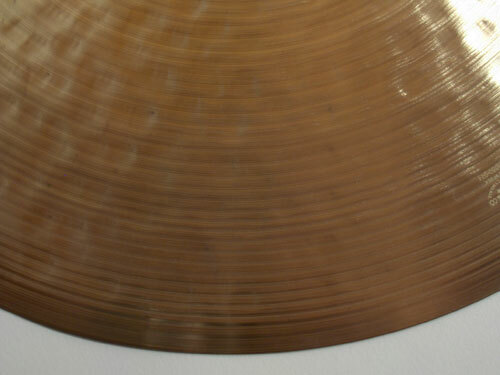 Jack de Johnette , also a pianist, is a big fan of these cymbals, which he associated, in reverse, with "flat-cymbals" ( single dome or no dome (we call usually "dome" or "bell", the smaller of the two domes)). 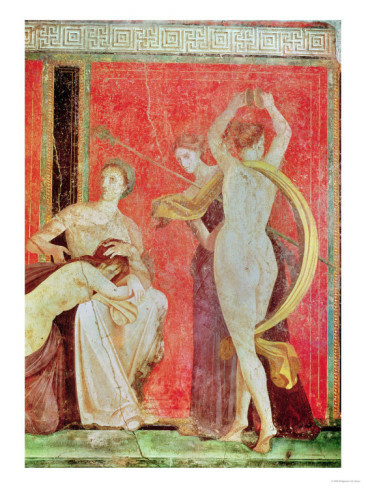 Greek cymbals were played in pairs by clashing a cymbal against another (with the same size), hollow against hollow on the edge, and held by leather straps passed through a hole in the center (it can be seen in Ancient Greek low-reliefs and a famous fresco from Pompeii (photo) preserved from the light under the ashes of Vesuvius). This method of play has not changed until the early twentieth century, with the invention of jazz modern drumset. At first instrument for dance accompaniment (including the use by Indian dancers, who use tiny cymbals attached to the thumb and the index, "finger cymbals" ( about 2.5 " diameter), which certainly inspired the gypsie castanets (gypsies are originated from India)) and for religious ceremonies (the people believed that they had the power to ward from "evil spirits", in ancient Greece, hence their introduction in tombs), it is probably the Turks during their conquest of Greece (capture of Constantinople by Mehmed II "the Conqueror" (1453), capital of the Byzantine Empire, and future Istanbul, the capital of Ottoman Empire, which was for long the center of the medieval world, standing between two dominant continents of the "Old World" Europe and Asia, where the supremacy of technology symbolized by the Turkish artillery, already announced the end of Christian feudalism and the rise of the future "New World" and the scientific and industrial era), who gave the most popular cymbal shape, as it is still used today, large and thin, with a medium capacity of saturation ("crash" (medium size) or "ride" (large), from 14 to 22'' diameter), in order to make martial and ceremonial use. 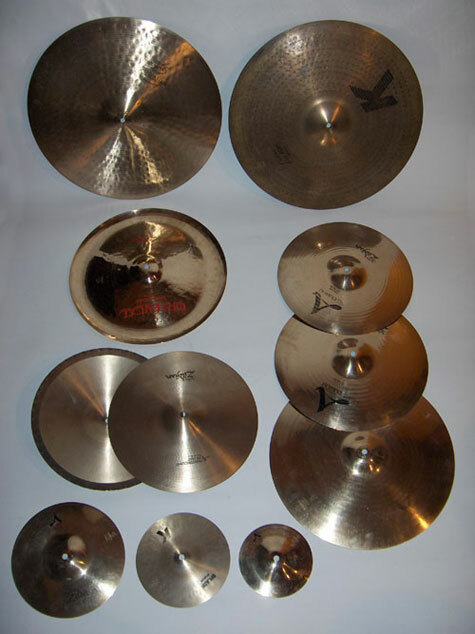 Besides they are still called "Turkish cymbals." A contemporary painting tells the story of the arrival of a Turkish embassy to the court of Louis XIV, after the treaty of alliance contracted with France, where the "Roi Soleil" (Litterally "Sun King") almost fell off his throne for the first hearing of so deafening (if any exists) musical instruments which accompanied the procession of gifts from the Sultan. Their use soon became popular in European in military bands, but it was not until the nineteenth century with a romantic and audacious composer (ie, "modern" for its time) in France, Hector Berlioz, to see its use in philharmonic orchestras (not without protest or reaction from the aristocratic and bourgeois "right-thinking" society). It is only with jazz that comes the idea of suspending the cymbals to stands and playing with a stick, rather than striking a cymbal against another. At first just hanging on a horizontal bar ("stem") with its strap or a string (as used by Warren "Baby" Dodds with "King" Oliver and Louis Armstrong), it is quickly "skewered" vertically in a rod (Ludwig, 1929, at first attached to the bass drum) with a wing ("butterfly") nut, and rested on a felt washer superimposed on a steel washer (to suppress friction sounds and parasites). The "double cymbal" pedal called "high-hat" ("charleston" in French, perhaps its original town (a contraction of "Charlestown"), which is also a jazz dance) is a later invention (1928, by Ludwig again). 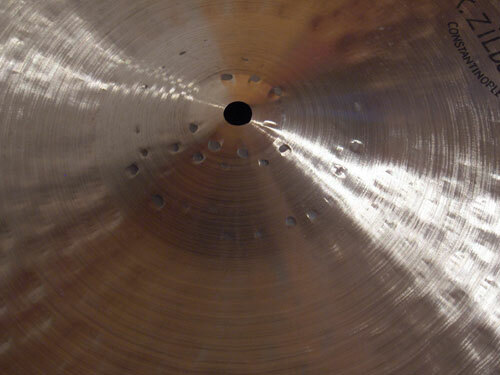 It is also at that time that Zildjian invents the "splash", a small and thin cymbal (6 to 12 ") at the request of Gene Krupa (one of the first virtuoso drummers), to put anecdotal and explosives accents but not too loud. The cymbals are no longer shaped by the laborious work of the blacksmith's hammer against the anvil, but by a press (except in Turkey (Istambul Mehmet and Agop brands (see videos above), former Zildjian craftsmen for example), where craftsmen still maintain the tradition of shaping with the hammer hitting by hand), and hammered then summarily to keep the original "crash" sound (this sound of "thunder" so typical, which so impressed Louis XIV and often used in background music, like film music or modern operas). 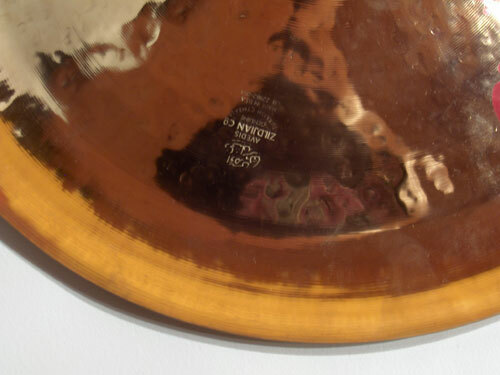 The Italian brand Ufip uses a unique modern manufacturing process of cymbal shaping by rotative molding ("rotocasting" (see video below)) which gives a very clear sound (on the model of church bell in fact) which doesn't have my preference like I guess a lot of drummers (to few low overtones and crash ("trash") sound) , but it has the advantages of originality, brightness, clearness, strength and being cheaper for equivalent alloy and finish (they were my first cymbals when I started to practice drumset, and I played them even in concert). Jazz-rock drummers (with amplified instruments and saturated sounds) of the 1970s (as Jack DeJohnette , Billy Cobham or Al Foster , all former drummers of Miles Davis's electric period), popularized the use of "Chinese cymbal" (very saturating) in the drum set, which the shape, with curved edge, comes back again from immemorial time. 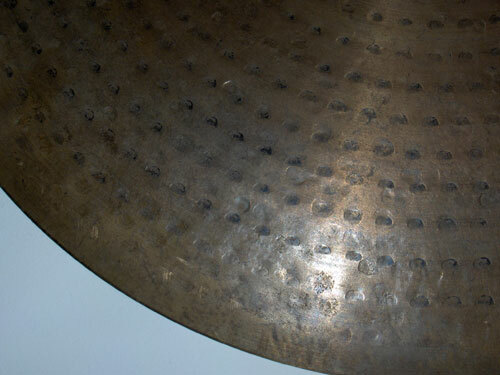 However, the Chinese cymbal (or simply "china" in U.S.) was already imported from China (like the "tom-toms") and used in early jazz drum sets. Some current manufacturers try to renew the instrument by adding a coat of paint (made by Paiste and used by Nicko Mc Brain for a while and Joey Jordison among others) or varnish (made by Sabian) which for my part, I do not find very convincing on the sound aspect. And I do not even mention electronic imitations which are miles away from reaching to copy the complexity of a natural timbre which makes from each note a unique sound, uncatchable and capable of transmitting and sublimate any subtlety of hitting gesture. 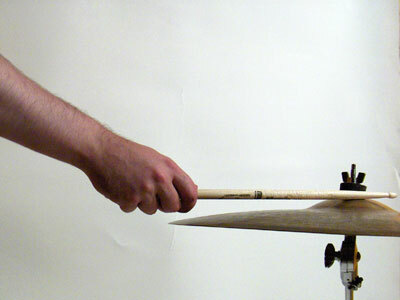 Contemporary jazz drummers did not make a mistake and have made the traditional Turkish cymbal, their prefered instrument, giving finally respectability (listen to Elvin Jones , Daniel Humair , Peter Erskine , Dave Weckl or Jack DeJohnette for example, who know better than anyone to fully used the expressive and musical potential of a cymbal). On the opposite, modern subtle variants in manufacturing and finishing methods add a real plus in terms of the variety of sounds and playing techniques. I would mention only the "leopard ride" for example, whose sparse hammering and total absence of chiselling was echoed by all brands. This finish has the effect of removing almost all saturation capacity and approaches the cymbal sound from a traditional gong sound, giving very "detached" notes ("stacatto"), ideal for a fast playing ( Jack de Johnette , Dave Weckl or Steve Gadd have adopted it and are loyal for a long time it is also my case). To simplify, we could say that the more a cymbal has a chaotic shape, the more it will be expressive, with rich timbre (lot of overtones), low pitched (or "dark"), uncontrollable and "crashing". Intensive manual hammering with a large diameter of hammer head, coupled with an intensive chiselling (or "lathing") in several layers (several passages in the same place), will achieve this (almost all brands now offers this kind of model which is close to the traditional shape). 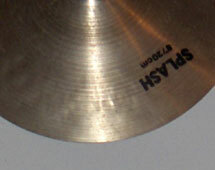 On the opposite, a few chiselling (or not chiselling at all), a polishing, regular hammer strokes (made by computer-controlled robot), and with thin diameter, and few number of them (or no hammer stroke at all ) give a very regular and "dry" (with little resonance) cymbal. You can refine this analysis a bit by adding that large hollow induced by hammer strokes determine the amount of low overtones (the more the strike is big and powerful the more it will be dark), and the chiselling determine high overtones (a cymbal without chiselling will have almost none and a chiselling and polished cymbal will only have super-high overtones, for example). 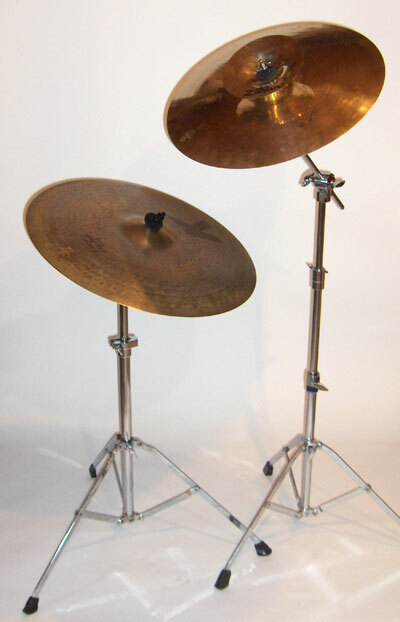 You can still dry the sound by reducing the size of the dome ("minicup") or simply deleting ("flat" ride), inventions of the 1970s (by and for Roy Haynes made by Paiste). The more a cymbal is thick the more its amplitude of vibration will be reduced it will therefore be with higher fundamental tone, more precise and even dryer. 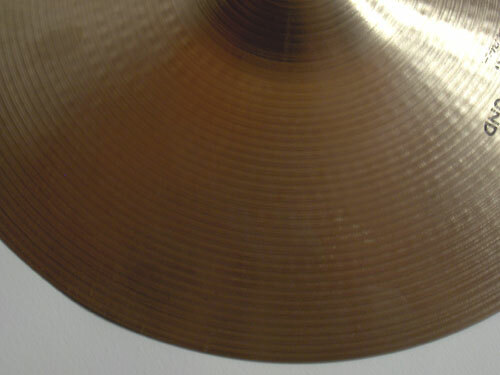 On the other hand, reaching a certain stage of refinement, a ride will be classified in the category of "crash" (this is not the size that differs fundamentally the "crash cymbal" from the "ride cymbal", but their ability to enter in "saturation", knowing that the more a cymbal is large, the less it saturates easily (for an equal thickness)). The more a cymbal will have a high fondamental tone, the less you will hear the sound of the stick, especially if the stick is dense, and therefore with high fundamental tone too. So, the cymbal which will enhance the best the stick sound will be big, not very thick (but still a little to not saturate too much) with big hand hammering (irregular) and without chiseling. 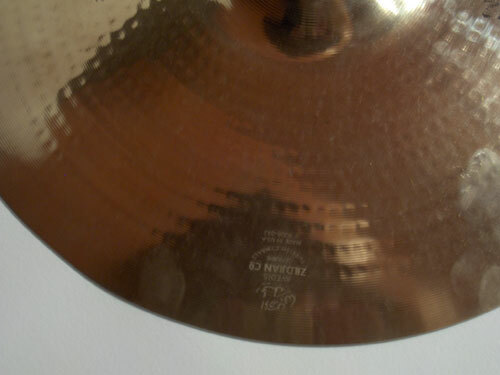 On the opposite, a thick cymbal, small (splash or crash) without hammering and chiseled intensively, do almost not let hear the stick sound and even more if it is in B8 alloy (with more copper, naturally higher). : : click to enlarge : : Tip stroke on the flat of cymbal, which is generally used to make the "chabada" (jazz ride common pattern in six beats and played in loop with the right hand: "ti - - tchi - ti ti - - tchi - ti"). 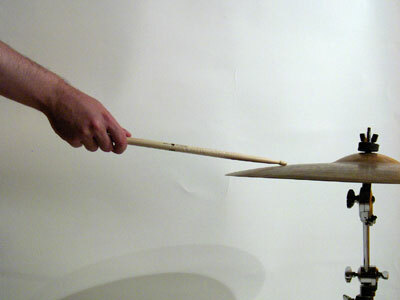 The resulting sound is dry, clear, and emphasizes the sound of the stick. : : click to enlarge : : Hitting with the shaft (handle) of drumstick on the flat of the cymbal which is generally used to saturate the cymbal. This is what gives the thundering sound of cymbals typical of Turkish origin (one hit against the other). 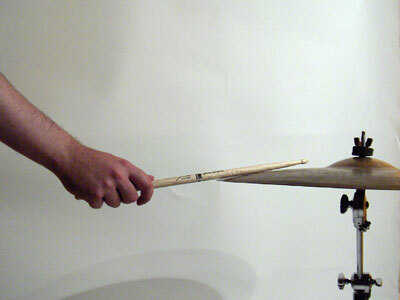 This stroke is often used in unison with the bass drum to mark a high point, the end of a break or toms descent. This is commonly called a "peach" in French ("pêche" meaning also a "punch" in French slang). : : click to enlarge : : The dome is usually hit with the shaft of the stick on the side and makes a dry, powerful and accurate tone, like a bell (either bronze or iron). Hence the misnomer drumset "bell". This stroke is of course often used in Latin jazz to mimic the cowbells. : : click to enlarge : : Shaft stroke perpendicular to the edge which make resonate the cymbal like a crotales (small Tibetan cymbal very thick and resonant ("tingsha")). This is an interesting stroke for atmospheric environments with a lot of rests (Jack DeJohnette, Peter Erskine or Daniel Humair often use it).